It’s go time. I know the big day has arrived when I see canoes in the parking lot of Mount Washington Ski Resort. The annual Royal LePage Snow To Surf Race is the ultimate way to sample all that the Comox Valley has to offer, in a single day. Breaking through the fading fog we boot kick our path to the summit in a mess of limbs and poles. Breathless with stars in our eyes we take in what we can. Big bluebird sky above, sparkling Salish Sea below. Tall trees and rolling hills fill the spaces in between. High speed corners, accidental air and deep tucks all the way to the base of the hill. A flash and it is gone. Pure fear morphed into sheer joy as the wild ride quickly ends. Undulating hills of fresh powder greet us around every bend. A winding single track trail dances through marshmallow coated trees. We are a caterpillar of colour crunching our way through the glades, watched closely by hungry Whiskey Jacks perched above. We fall into a heavy rhythm of breath and swift steps, racing through this magical winter wonderland. Clean groomed trails and glistening meadows provide us with a beautiful handrail. We round the next bend and the Beaufort Range appears before us, nearly taking our breath away. Alpine glow paints Mt. Albert Edward’s distinct ridge line in perfect pink gold. The conditions are perfect. The snow is kind. 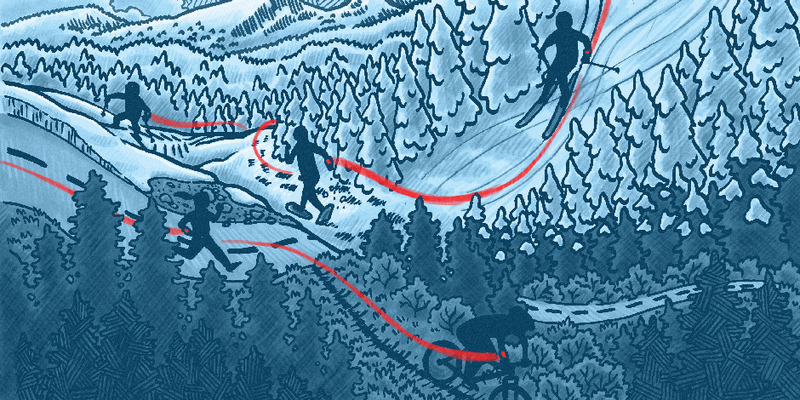 We kick, pole and glide in synchronicity until we reach the trails end. We are falling fast. Gravity assists our transition from snowy alpine to lush valley bottom. Sparse groves of sub alpine fir make way for towering douglas fir, spruce and hemlock. White fades to green and the smell of spring rises from the warming earth. Our thighs will tell the tale of this decent for days. Big gears turn, quads burn and signs of logging blur along the road side. 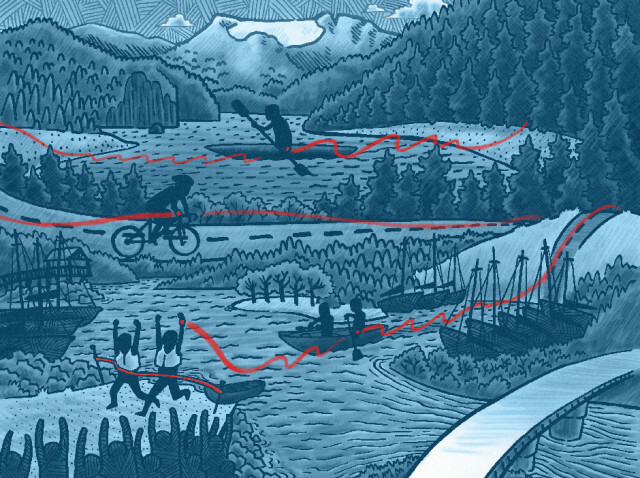 We push onward, over the Puntledge River and past secret swimming holes. The route climbs steadily upward, following the ‘pipeline’ of vital water flowing from Comox Lake. A turn into the woods and we are all single track smiles. The trail takes us on a historical tour of old Bevan town. We are up and down black coal hills and winding between lost buildings as we follow the green waters of the Puntledge River to its source. Into the deep blue waters of Comox Lake we leave the busy shore of cheers and jeers behind. The majestic Glacier watches over us from the west. Hills covered in rich green trees and patched with signs of industry fill the seats of this natural theatre. From above we are specks of yellow, red, green and blue cutting quickly across the lake from Courtenay to Cumberland. We find a rhythm of steady strokes and keep our eyes on the prize. It is time to cover some ground. Time to dig in, tuck low and crank out some big circles. Geography, history and community fly by in a blur. The winding lake shore, dark forest and towering cliffs merge with colourful village life. In Cumberland, industry, tourism, mountain bikers, families and creative small businesses criss-cross to create a cross hatch pattern of village life. We are big wheels, tight and bright jerseys and all lungs from Cumberland to Royston. Finally, through Courtenay in a flash and to the sea. Urban Airpark path under foot and pleasure aircraft overhead, the excitement of an entire community cheering us onward from the sidelines. Painful brute force is stirred with elation as paddles plunge, we sprint to the boats at the Marina. Splash and dash and we are in the fast flow of the Courtenay River Estuary. The wild crowd is juxtapozed by gentle bobbing seals greeting us, resting Canadian geese and massive eagles are perched along the shore. We are reaching far, dipping deep to pull our boat forward, through the river to meet the oceans chop. In moments we will arrive at our final destination and the end of our magical cross-valley journey. As we gain on the Comox Marina we can hear our team name being called. One last look behind and it all comes together. Another gorgeous rediscovery of this place. We see the path we have just travelled from Mt. Washington to Comox Lake below the Glacier across to Cumberland, Royston, Courtenay and finally Comox by the sea. We are ocean to alpine. We are alpine to ocean. We are everything in between.